I have three fun cards to share with you today, they all feature the incredibly cute More Monsters stamp set. For my first card I created a fun shaker card using the Stitched Collage Frame. Each monster was given his own window, and I filled the window with coordinating Pretty Pink Posh sequins and Queen & Co Diamonds. Don't these cuties look adorable holding hands? There are actualy a few of the monsters in this set that hold hands perfectly. 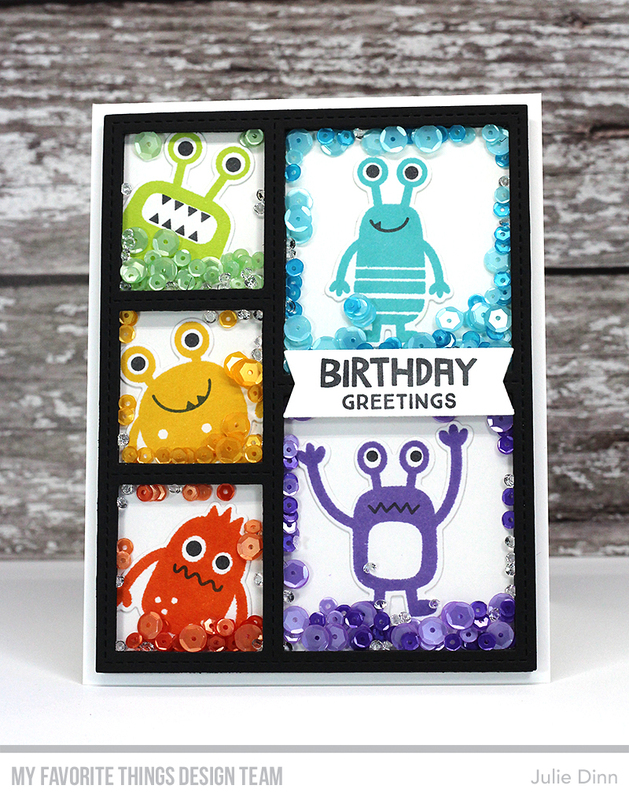 For this card I decided to stamp the same monster in three colours, Orange Zest, Limelight, and Daffodil. My final card is simple, but cute! I couldn't resist stacking these little monsters. Fabulous cards! I love the monsters! !